My favorite menu item at Mexican restaurants is the Chicken Chimichanga. So when I found myself with extra wonton wrappers after making these Crab and Cream Cheese Wontons, I decided to make Mini Chimchangas! I simply stuffed each wonton wrapper with some refried beans, leftover shredded chicken, cheddar cheese, and olives (you can really just use whatever you have on hand in your pantry or any leftovers in the fridge), sealed them, and deep fried until golden brown. 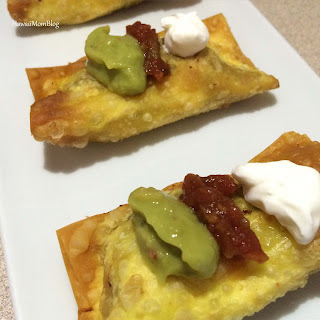 I served the Mini Chimichangas with salsa, guacamole, and sour cream. Such a yummy way to use up pantry items and/or leftovers!